Work stopped on major site as administration bites. It is just over a week since DemolitionNews broke the story that long-established Welsh contractor Cuddy Group had appointed an as-yet-unnamed administrator. Sadly, it appears that the crisis at the company is deepening. Industry news portal Construction News is reporting that work has been halted on at least one major project. 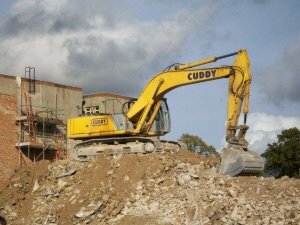 Furthermore, calls by Construction News, Demolition News and – no doubt – a large number of concerned creditors continue to go unanswered across Cuddy Group offices. According to Construction News, the ongoing administration has resulted in work being halted on the demolition of the former Pontrilas factory in Llanelli. Carmarthenshire Council confirmed that the project was now “on stop”, and that it was in discussions with Cuddy operatives. At the time of writing, Cuddy Group continues to appear as “compliant” on the website of the National Federation of Demolition Contractors. Posted: July 19th, 2018 under Insolvency.